The RSPB is stepping up a campaign to protect a rare bird that has survived in Cornwall but disappeared in Devon and Somerset. Three years ago only 50 pairs of corn buntings were left in the county - 80% of the birds have disappeared from their farmland habitats since 1980. 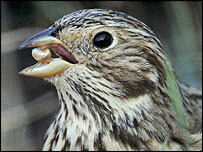 Now the RSPB is planning in-depth research into the breeding patterns of the birds. It is hoped habitat work carried out by farmers will create safe nesting sites.